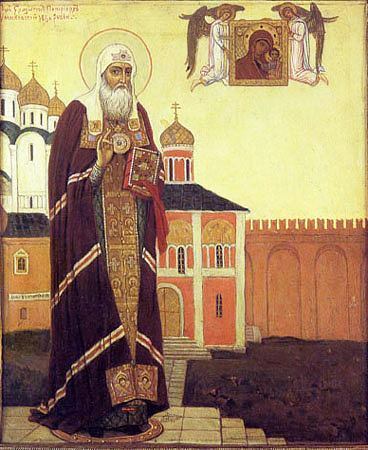 The Hieromartyr Hermogenes, Patriarch of Moscow and all Rus, was born in Kazan around 1530, and was descended from the Don Cossacks. According to the Patriarch’s own testimony, he served as priest in Kazan in a church dedicated to Saint Nicholas, near the Kazan bazaar. Soon he became a monk, and from 1582 was archimandrite of the Savior-Transfiguration Monastery at Kazan. On May 13, 1589 he was consecrated bishop and became the first Metropolitan of Kazan. 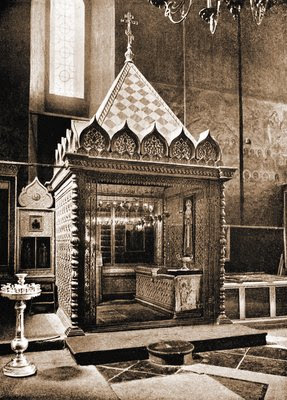 The relics of Saint Germanus, the second archbishop of Kazan (Nov. 6), who died at Moscow on November 6, 1567 during a plague, were transferred and buried in Saint Nicholas Church in 1592. 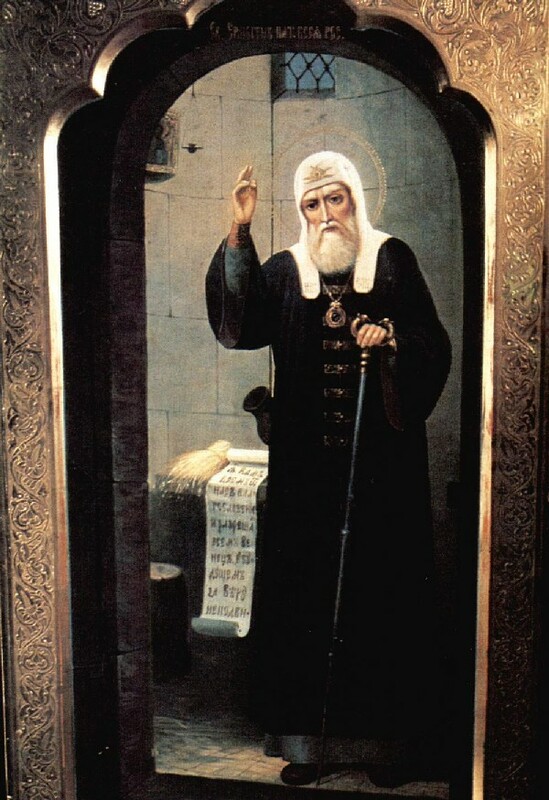 With the blessing of Patriarch Job (1589-1605), Saint Hermogenes reburied the relics at the Sviyazhsk Dormition Monastery. At the same time he mentioned three martyrs who had suffered at Kazan for their faith in Christ, one of whom was a Russian named John (Jan. 24) born at Nizhny Novgorod and captured by the Tatars. The other two, Stephen and Peter (Mar. 24), were newly-converted Tatars. 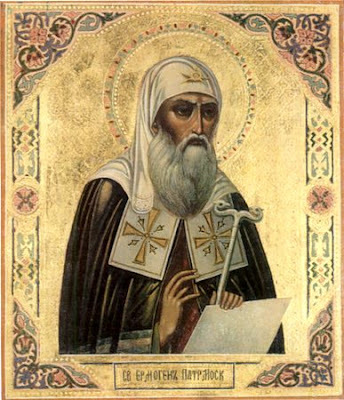 The Saint expressed regret that these martyrs were not inserted into the diptychs read on the Sunday of Orthodoxy, and that “Memory Eternal” was not sung for them. 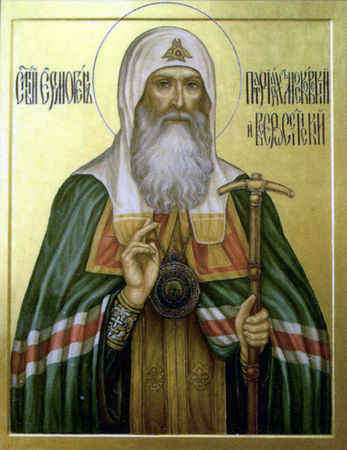 In answer to Saint Hermogenes, the Patriarch issued a decree on February 25, which said “to celebrate at Kazan and throughout all the Kazan metropolitanate a panikhida for all the Orthodox soldiers killed at Kazan and the environs of Kazan, on the Saturday following the Feast of the Protection of the Most Holy Theotokos (October 1), and to inscribe them in the great Synodikon read on the Sunday of Orthodoxy,” and also ordered that the three Kazan martyrs be inscribed in the Synodikon, leaving it to Saint Hermogenes to set the day of their memory. Saint Hermogenes circulated the Patriarchal decree throughout his diocese, and required all the churches and monasteries to serve Liturgies, Panikhidas and Lityas for the three Kazan martyrs on January 24. 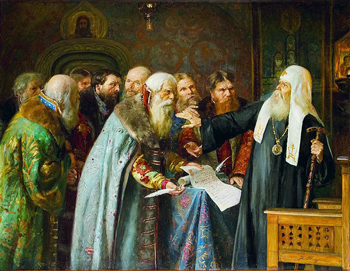 Patriarch Hermogenes refuses to sign a decree on the dissolution of the militia. In 1595, with the active participation of Saint Hermogenes, the relics of the Kazan Wonderworkers Saint Gurias the first archbishop of Kazan (Oct. 4), and Saint Barsanuphius the bishop of Tver (Oct. 4) were discovered and uncovered. Tsar Theodore Ioannovich (1584-1598) had given orders to erect at the Kazan Savior-Transfiguration Monastery a new stone church on the site of the first one, where the Saints were buried. Having been found worthy of the patriarchal throne, Metropolitan Hermogenes was elected to the Patriarchal See, and on July 3, 1606 he was installed as Patriarch by the assembly of the holy hierarchs at Moscow’s Dormition Cathedral. Metropolitan Isidore handed the Patriarch the staff of the Holy Hierarch Peter of Moscow the Wonderworker (Oct. 5), and the Tsar gave as a gift to the new Patriarch a panagia, embellished with precious stones, a white klobuk and staff. In the ancient manner, Patriarch Hermogenes made his entrance riding upon a donkey. 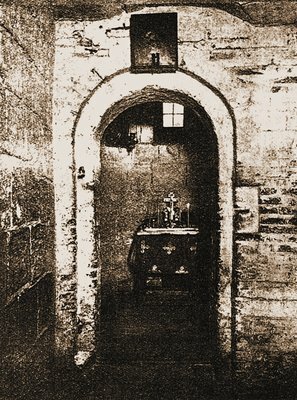 Prison cell of Patriarch Hermogenes at Chudov Monastery. Soon the righteous judgment of God fell upon the Brigand of Tushino: he was killed by his own close associates on December 11, 1610. But Moscow continued to remain in peril, since the Poles and traitors, loyal to Sigismund III remained in the city. The documents sent by Patriarch Hermogenes throughout the cities and villages, exhorted the Russian nation to liberate Moscow from the enemies and to choose a lawful Russian Tsar. 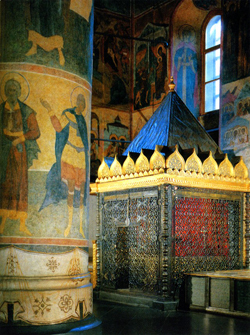 Tomb of St. Hermogenes at Dormition Cathedral in Moscow. On Bright Monday in 1611, the Russian militia approached Moscow and began the siege of the Kremlin, which continued for several months. Besieged within the Kremlin, the Poles often sent messengers to the Patriarch with the demand that he order the Russian militia to leave the city, threatening him with execution if he refused.